You don’t know Jack about this week’s releases. 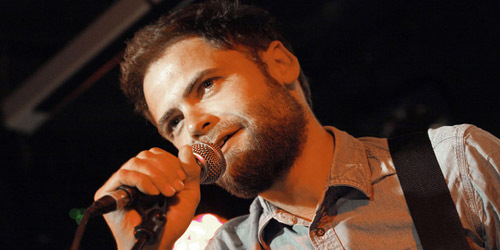 Featuring the radio singles “Connected By Love” and “Over And Over And Over”, the former in the top 20 at Triple A radio and the latter in the top 30 at Alternative radio, White hopes to bring his streak of solo #1 albums to three with his current set. Can he do it? Stay tuned. Davis’s first single to make the Country radio chart, “Singles You Up”, has enjoyed a slow ride into the top ten and is currently closing in on the top five. Look for this set to have a good chance of becoming the top title on that genre’s album chart next week. Next week: look out for new albums from Hayley Kiyoko, Kacey Musgraves and more. For Adam’s personal picks of the week, listen to the PGTC Friday Faves list on Spotify! There were about five million songs that was I interested in writing about this week, and not nearly enough time to do it. So, I made a list of ten of them, with streaming links and Rewind history all listed below. Enjoy this week’s condensed version, and tell me how you’re feeling about the selections! The Hole story and nothing but it. At just four weeks old, Coldplay‘s “Atlas” is the fastest climbing song of the year by far, already up to #3. It comes from the soundtrack to the upcoming movie The Hunger Games: Catching Fire. Last year, Adele‘s “Skyfall”, also from a movie (Skyfall, as if you couldn’t tell), made it to #1 in its sixth week. Can the band beat her by a week or tie the run she set last year? Will “Atlas” make it to #1 period? Stay tuned! Rolling into this week’s top ten is the second hit in a row for the Australian sextet Sheppard, leaping 15-10 with “Hold My Tongue”. They previously made it to #10 for three weeks with “Let Me Down Easy” earlier this year. In the history of musical mouths, only one has tied its tongue around the top spot, appropriately titled “Tongue Tied” by Grouplove. It spent two weeks at #1 last year. As for the Hot 100, you have to go way back to 1971 to tickle the taste buds of top 40 hits; that’s when Brenda & The Tabulations went to #23 with “Right On The Tip Of My Tongue”. There’s your useless musical trivia for the day. This week’s Highest Debut is the second entry for The 1975, who debut at #38 with “Girls”. The four members in the band met at school in Wilmslow, England. Their first single, “Chocolate”, climbs to #2 after three consecutive weeks at #3. Take two boys from Ireland who look like models, give them some guitars and a fan base of thousands and you have a blueprint for one of the top new talents around. At just 19 and 21 years old, respectively, the siblings of Hudson Taylor are destined for some big action in 2014. After opening for other bands over the past few years, like British quartet Lawson, they’ll be setting out on a run of shows all on their own in the next few months. However, the guys still have one thing eludes them: breaking the U.S. market. With their newrelease “Care”, that could all change very quickly. If you hear the potential that I did listening to it for the first time, you know how large it could be. 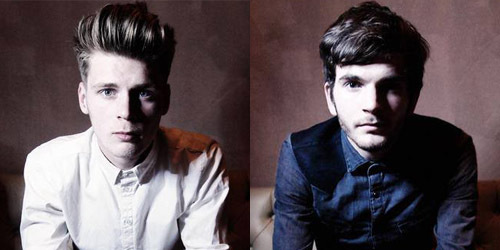 The duo of Alfie and Harry Hudson-Taylor grew up on the streets of Dublin in a household full of entertainers. They busked their way around and crafted a set of original songs, releasing their debut EP, Battles, in August of last year. It topped the iTunes charts in their home country and cracked the top 20 in the United Kingdom. Another EP, Cinematic Lifestyle, followed in November. The two EPs were pulled, than rereleased to digital retailers last month after the two signed to Polydor Records, their first major label deal. Now in the process of recording for their first full-length album, Hudson Taylor is out with yet a third EP, titled Osea. It will be released on October 13 in Europe with no Stateside issue at the moment, though they do have the 4-track release Chasing Rubies which is available here. If you’re an avid music video fan, “Care” is being featured on YouTube at the moment on a playlist titled Devil’s Resting Place along with other songs by John Newman and Tom Odell, so may just see it pop up on the sidebar of your page. It’s amassed over 130,000 views so far in the three full days its been up, which is outstanding considering that it’s about to pass a video for their song “Battles”, which has been up for a year. Like a lot of Polydor releases, most are distributed through Interscope and A&M in the United States, and this finds the two on an Interscope sublabel, Cherrytree Records, which is also home to Ellie Goulding, Sting and many others. So, why should “Care” be the song that carries them in the U.S.? At the moment, Cherrytree doesn’t have a big single on the AAA, or Triple A survey, full of other singer-songwriters and independent acts. Hudson Taylor would be a perfect fit there. The song’s musically accessible and lyrically relatable, about a guy who is love struck over a girl who doesn’t understand that her current flame isn’t the right choice. Whether that’s just his opinion or what he’s actually observing, I guess that decision is to made by the listener. He cautions her, “Think a little harder when you’re feeling all alone/For heaven’s sake, I have been screaming at you all the time… he’s been cheating on you, messing with your head/I only say it ’cause I care.” It’s folk and indie rock, but it’s also poppy enough to stand out and get its message across in under three minutes in length. It’s capable of picking up major airplay at AAA, followed by a release to Alternative and Hot AC radio. It’s bursting with not only sincerity, but a ton of appeal as well. First, however, it needs to be made available for purchase. Then, we can all watch it explode. At this point, the duo doesn’t have any plans to start touring in the United States. This fall, they’ll be all over England and Ireland on tour, first as a support act for the Irish band Kodaline and then headlining their own shows, which will probably be followed by the album. When the chance comes for that Stateside arrival to emerge, however, they should grab it and hold on tight. Sharing is caring, and since I “care” enough about them, let’s get the ball rolling and see where Hudson Taylor land on their worldwide trip to the top.